"An attack on these sort of installations would be greatly facilitated by having this sort of detailed photograph available"
Detailed photos of some of Britain's most secret establishments - including GCHQ and the Aldermaston atomic weapons research centre - are being sold on the internet by a UK company. 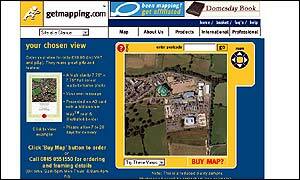 Getmapping.com openly advertises aerial pictures of the centres on its website, which it calls a complete photo survey of the country. The images are legal, but defence experts have called for them to be banned, because they could be used by terrorists to plan attacks. The website - in which the Queen invested during the dot.com boom - enables customers to enter postcodes or map coordinates, to view photographs of their chosen area. It provides a list of what it calls "secret places", including Aldermaston and GCHQ, of which high-resolution prints can be bought for £45 plus VAT. BBC Radio 4's Today programme bought three images - including one of the Sellafield nuclear power station. Charles Shoebridge, a former anti-terrorist intelligence officer with the Metropolitan Police, told Today the images could be "incredibly useful" to terrorists. "The resolution is crystal-clear - absolutely everything that you would want to be able to see, you can see on these photographs. "You can see pipework, you can see buildings, large tanks presumably containing chemicals of some sort. "An attack on these sorts of installations would be greatly facilitated by having this sort of detailed photograph available. "What you've got here is essentially a very high-quality and very detailed reconnaissance of the area. "You could identify key points, key locations for explosives, for example to cause the maximum damage. "It seems ridiculous that these sorts of detailed photographs can be available - particularly as these are easily identified as potential terrorist targets." Retired colonel Michael Dewar, defence and counter-terrorism analyst, said putting such security-sensitive material on to the web was "the height of folly and the height of irresponsibility". David Rendel, Liberal Democrat MP for Newbury, Berkshire, was also concerned about enabling a terror attack on nearby Aldermaston. "If there were a serious terrorist attack we could all be in danger. "There's no reason why we should give the terrorists the sort of information they're looking for as easily as providing it over the internet. We want to make life difficult for them." But Getmapping's MD, Tristram Cary, told BBC News Online the photographs had been approved by the Ministry of Defence. "We're not experts in counter-terrorism, we asked for advice from the MoD and we were cleared." A letter sent to him in 2000 said there were "no security problems whatsoever" - and when he checked on Thursday he was told the advice was the same. "We need to have a coherent approach. Besides other websites with high-resolution satellite data, people can visit some of these sites - you can visit Sellafield, you can take photographs from the perimeter fence." He pointed out that there was also an "open skies" policy in the UK, under which anyone could fly 3,000 feet (915 metres) over sites and take their own detailed photographs. He suggested that perhaps MI5 welcomed the site as a "controlled channel", as buyers had to leave their credit-card details and e-mail addresses, thus leaving an identity trail. Rear Admiral Nick Wilkinson, the defence official who issued Getmapping the advice, said there had been no point in trying to prevent publication of the photos, because they were available elsewhere. "Technology has changed and there are a number of international websites which sell satellite photographs. "If people have something they need to hide for security reasons, some detail, they must find some other way of covering it locally on site - for example putting up a cover or a roof." However, the former chairman of the Commons intelligence committee Lord King said such policies had been made obsolete since 11 September. "All democrat societies [need] to really tighten up on their security. Of course they may be available elsewhere, but you don't make it easier for people. "I certainly think they need to revise completely their advice on this matter."